George Ellery Hale (1868–1938) was an influential astrophysicist and science administrator. This collection of Hale’s scientific, professional, and personal papers documents his roles in inventing the spectrohelioscope, promoting international cooperation among scientists, and founding major observatories and other scientific institutions. After receiving his B.S. 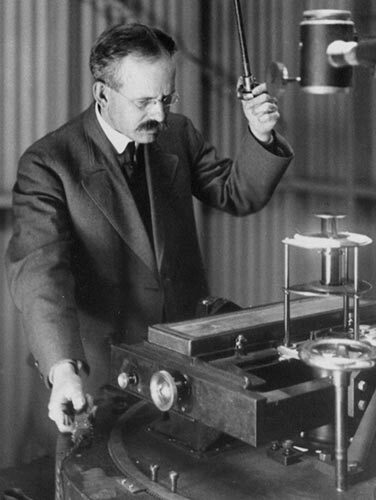 from MIT in 1890, Hale quickly established a scientific reputation for his invention of the spectroheliograph, then made important contributions to the study of solar phenomena, organized and coedited the Astrophysical Journal, and led the design, funding, and construction of the Kenwood Observatory in Chicago, Yerkes Observatory in Wisconsin, Mount Wilson Observatory near Pasadena, California, and Palomar Observatory near San Diego. These observatories hosted the world’s largest and most sophisticated telescopes. After Hale became director of the Mount Wilson Observatory in 1904, he became deeply involved in Pasadena’s local education and culture, including the creation of the California Institute of Technology and the Huntington Library. Meanwhile, Hale revivified the National Academy of Sciences by organizing the National Research Council, obtaining a substantial endowment, and establishing the National Research Council Fellowships. Before World War I, Hale was a founder of the International Union of Cooperation in Solar Research, Foreign Secretary of the National Academy of Sciences, and frequent delegate to the International Association of Academies. After the war, he was instrumental in the establishment of the International Research Council and served as president of its successor, the International Council of Scientific Unions, from 1931 to 1934. The Caltech Archives, in collaboration with the Huntington and the Carnegie Institution, published this web edition of the Hale Papers on the 150th anniversary of Hale’s birth. You may navigate it by selecting a folder to view using the collection guide, by browsing the same guide in the Online Archive of California, or by searching the full text of all typed papers using the search box above. Hale’s wide-ranging correspondence forms a particularly valuable and accessible portion of this collection. Among his correspondents were prominent scientists, including Franz Boas, Walter Cannon, Albert Einstein, and Ernest Rutherford; inventors, including Alexander Graham Bell and Nikola Tesla; industrialists, including Andrew Carnegie and Henry Huntington; politicians, including Herbert Hoover, Gifford Pinchot, and Elihu Root; and Caltech faculty, including Robert Millikan, Thomas Hunt Morgan, and Arthur Amos Noyes. This search mostly finds typed documents and mostly misses handwritten ones. We recommend also browsing the collection guide.